Craniosacral therapy. To fully understand what craniosacral therapy is, it’s important to first learn where and what the craniosacral part of the body is. Caron Chiropractic Clinic has been using craniosacral therapy as a method to treat a broad spectrum of issues, and allow the body to heal and enhance itself for quite some time. 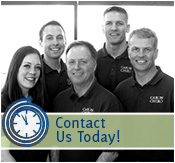 If you live in St Paul, MN, it’s time to try craniosacral therapy at Caron Chiropractic Clinic. The craniosacral system is made up of the membranes and fluid that surrounds, protects, and nourishes the brain and spinal cord. Try bringing it back to the good ole Anatomy 101 days. Do you remember the role of the brain and spinal cord? Your entire neurological system comes from the brain and spinal cord. It dictates your personality, the way you move, the way you speak. Your neurological system dictates who you are. Therefore, our bodies understand that to protect and nourish this system, we need something equally important, your craniosacral system. As your body endures stress, strains, and accidents, the craniosacral system compensates so that your brain and spinal cord are kept safe. Unfortunately, the changes to the craniosacral system can mean tightened body tissues and tension around the nervous system. This is why craniosacral therapy is a must. Fortunately, craniosacral therapy is done at our Caron Chiropractic Clinic in St Paul, MN. When your craniosacral system has been restricted, it can be debilitating. No amount of drugs can change that. Fortunately, these restrictions can be corrected by a trained professional at Caron Chiropractic Clinic in St Paul. With the right amount of knowledgeable touch, our practitioners use their hands to evaluate the system, feeling the various locations of your craniosacral system, and then utilizing those findings to administer soft touch techniques that release restrictions and influence healing in the craniosacral system. Craniosacral therapy has been known to relieve so many different things. From chronic pain and injuries to stroke and neurological impairments. Even children and infants can benefit from craniosacral therapy. Those that have experienced stress early on, like birth trauma, can use craniosacral therapy to prevent future deficits like learning disabilities or hyperactivity. It can also be used as a preventative measure for anyone wishing to have their craniosacral system evaluated. For more information on craniosacral therapy in St Paul, call Caron Chiropractic Clinic, P.A. today at (651) 255-9999. This entry was posted	on Tuesday, May 24th, 2016 at 2:02 pm	and is filed under Chiropractic Treatments, Craniosacral Therapy. You can follow any responses to this entry through the RSS 2.0 feed. You can leave a response, or trackback from your own site.